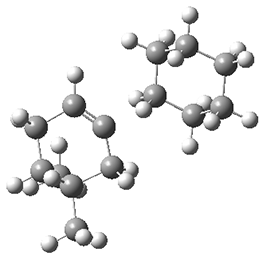 The authors note that this molecule is chiral, having near D2 symmetry. 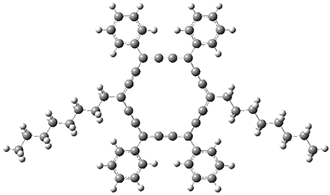 (The optimized structure has D2 symmetry.) They performed AM1 computations to estimate a very low barrier for racemization of only 17.3 kcal mol-1, leading to a half-life of less than one second at RT. 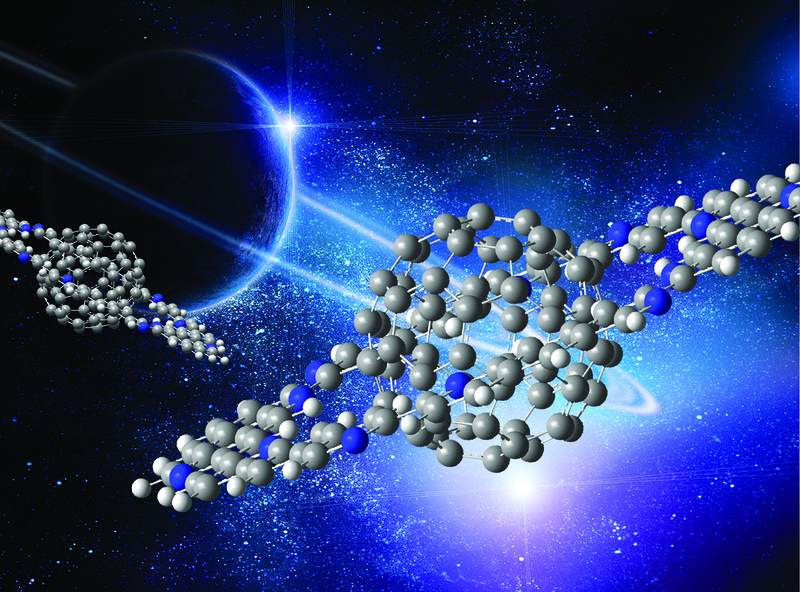 In a follow up study, this group examined the thermal and photo cyclization of 13,14-dimethylcethrene 4.2 The added methyl groups make the centhrene backbone more helical, and this precludes the formal allowed disrotatory process. The methyl groups also prohibit the oxidation that occurs with 1, driven by aromatization, allowing for the isolation of the direct product of the cyclization 5. 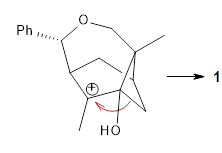 This anti stereochemistry is confirmed by NMR and x-ray crystallography. The interconversion between 4 and 5 can be controlled by heat and light, making the system an interesting photoswitch. Also of interest is the singlet-triplet gap of 1 and 4. The DFT computed ΔEST is about 10 kcal mol-1 for 4, larger than the computed value of 6 kcal mol-1 for 1b. The EPR of 1b does show a signal while that of 4 has no signal. 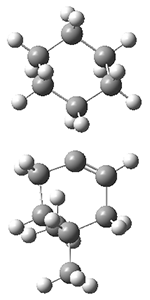 To assess the role of the methyl group, they computed the singlet triplet gaps for 1b and 4 at two different geometries: where the distance between the carbons bearing the methyl groups is that in 1b (3.03 Å) and in 4 (3.37 Å). 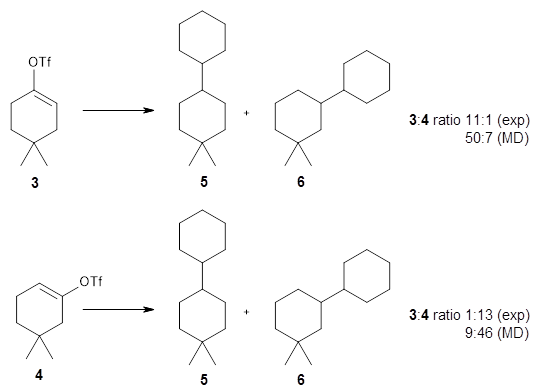 The lengthening of this distance by the methyl substituents is due to increased helical twist in 4 than in 1b. For 1b, the gap increases with twisting, from 7.1 to 8.3 kcal mol-1, while for 4 the gap increases by 1.8 kcal mol-1 with the increased twisting. This change is less than the effect of methyl substitution, which increases the gap by 2.2 kcal mol-1 at the shorter distance and 2.8 kcal mol-1 at the longer distance. 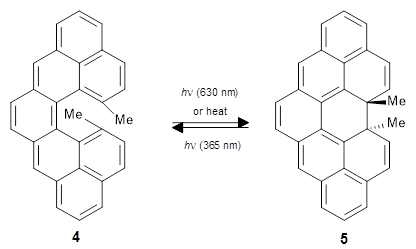 Thus, the electronic (orbital) effect of methyl substitution affects the singlet-triplet gap more than the geometric twisting. 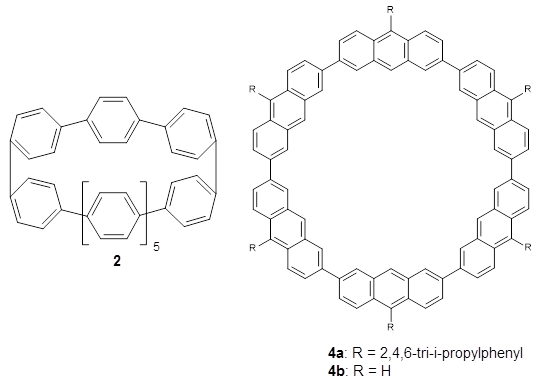 ring compounds 1, 2, and 3 were prepared and the x-ray structure of 2 was obtained. 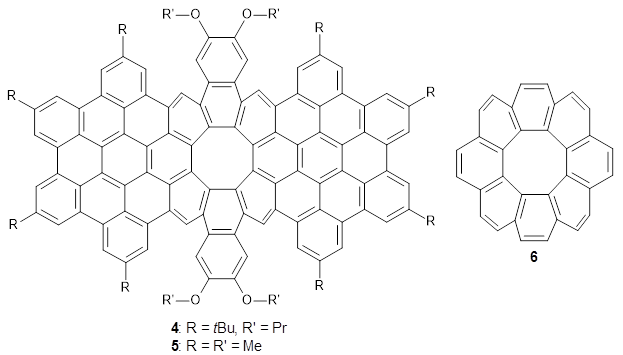 The B3PW91/6-31G(d,p) optimized geometries of 1-3 and of the tetra ring 4 are shown in Figure 1. Figure 1. 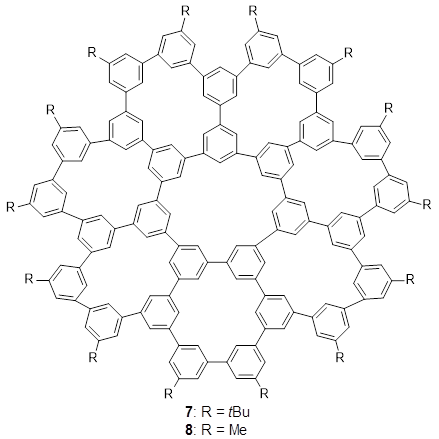 B3PW91/6-31G(d,p) optimized geometries of 1-4. Since the rings are composed of 18 π-electrons in the π-system perpendicular to the nearly planar ring, the natural question is to wonder if the ring is aromatic. The authors computed NICS(0) and NICS(1) values at the center of the C18 rings. 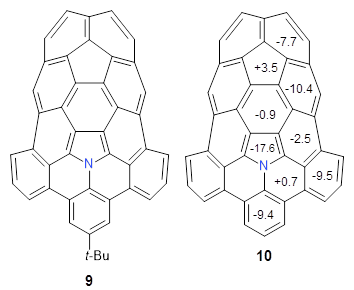 For all four compounds, both the NICS(0) and NICS(1) values are negative, ranging from -12.4 to -14.9 ppm, indicating that the rings are aromatic. 1) Chongwei, Z.; Albert, P.; Carine, D.; Brice, K.; Alix, S.; Valérie, M.; Remi, C., "Carbo‐biphenyls and Carbo‐terphenyls: Oligo(phenylene ethynylene) Ring Carbo‐mers." Angew. Chem. Int. Ed. 2018, 57, 5640-5644, DOI: 10.1002/anie.201713411. 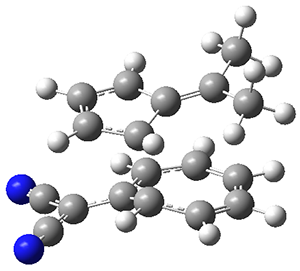 I have recently been interested in curved aromatic systems – see my own paper on double helicenes.1 In this post, I cover four recent papers that discuss non-planar aromatic molecules. 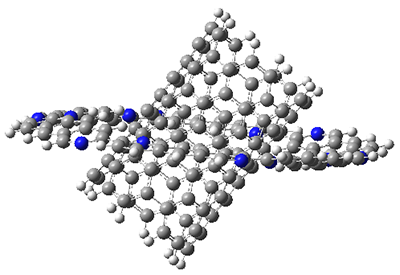 The first paper2 discusses the warped aromatic 1 built off of the scaffold of depleiadene 3. 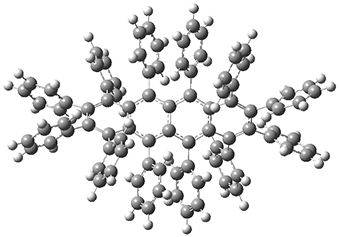 The crystal structure of 1 shows the molecule to be a saddle with near C2v symmetry. 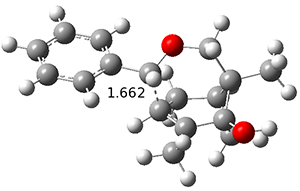 B3LYP/6-31G computations indicate that the saddle isomer is 10.5 kcal mol-1 more stable than the twisted isomer, and the barrier between them is 16.0 kcal mol-1, with a twisted saddle intermediate as well. 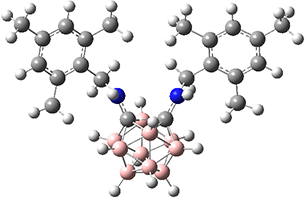 The PES is significantly simpler for the structure lacking the t-butyl groups, 2. 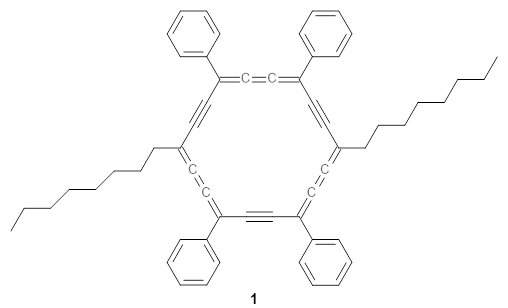 The B3LYP/6-31G PES of 2 has the saddle as the transition state interconverting mirror images of the twisted saddle isomer, and this barrier is only 1.8 kcal mol-1. Figure 1 displays the twisted saddle and the saddle transition state. 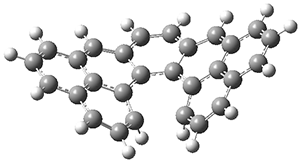 Clearly, the t-butyl groups significantly alter the flexibility of this C86 aromatic surface. One should be somewhat concerned about the small basis set employed here, especially lacking polarization functions, and a functional that lacks dispersion correction. However, the computed geometry of 1 is quite similar to that of the x-ray structure. Figure 1. 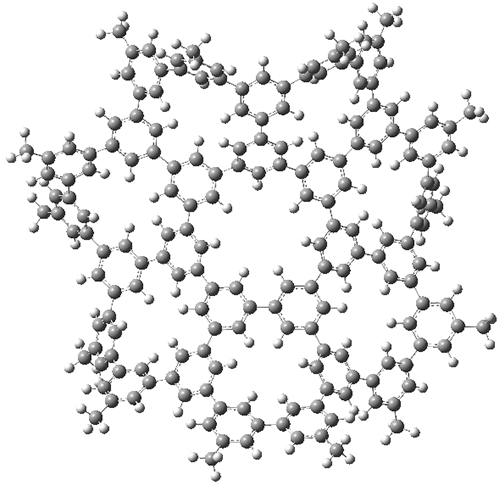 B3LYP/6-31G optimized geometries of the isomer of 2. 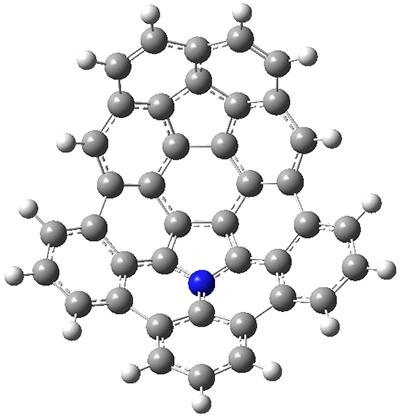 The second paper presents 4, a non-planar aromatic based on circulene 6.3 (See this post for a general study of circulenes.) circulene has a tub-shape, but is flexible and can undergo tub-to-tub inversion. 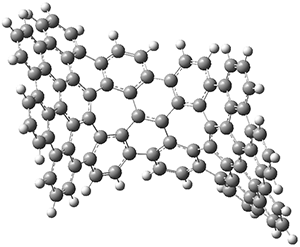 The expanded aromatic 4 is found to have a twisted shape in the x-ray crystal structure. 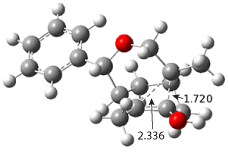 A simplified model 5 was computed at B3LYP/6-31G(d) and the twisted isomer is 4.1 kcal mol-1 lower in energy than the saddle (tub) isomer (see Figure 2). 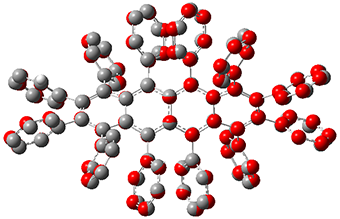 The barrier for interconversion of the two isomers is only 6.2 kcal mol-1, indicating a quite labile structure. Figure 2. 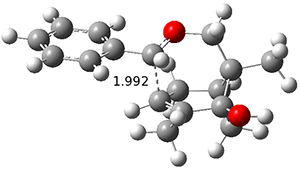 B3LYP/6-31G(d) optimized geometries and relative energies (kcal mol-1) of the isomers of 5. Figure 3. 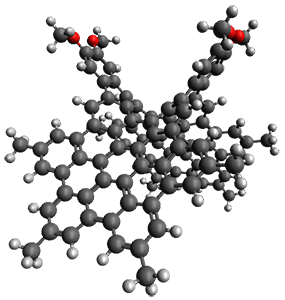 PM6 optimized structure of 8. 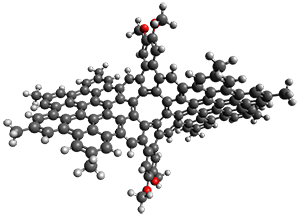 The fourth and last paper describes the aza-buckybowl 9.5 The x-ray crystal structure shows a curved bowl shape with Cs symmetry. NICS(0) values were computed for the parent molecule 10 B3LYP/6-31G(d). These values are shown in Scheme 1 and the geometry is shown in Figure 4. 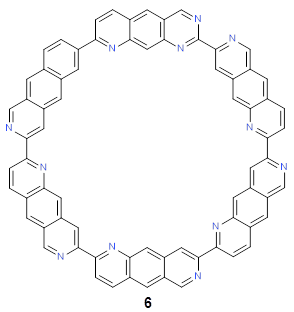 The 6-member rings that surround the azacylopentadienyl ring all have NICS(0) near zero, which suggests significant bond localization. Figure 4. B3LYP/6-31G(d) optimized structure of 10. Our understanding of what aromaticity really means is constantly being challenged! 1. 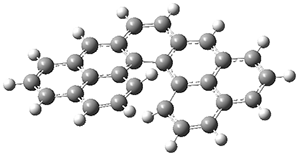 Bachrach, S. M., "Double helicenes." Chem. Phys. Lett. 2016, 666, 13-18, DOI: 10.1016/j.cplett.2016.10.070. of 86 Carbon Atoms." Angew. Chem. Int. Ed. 2018, 57, 1581-1586, DOI: 10.1002/anie.201711437. 3. 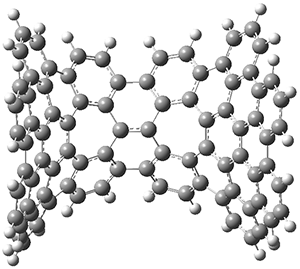 Yin, C. K.; Kit, C. C.; Zhifeng, L.; Qian, M., "A Twisted Nanographene Consisting of 96 Carbon Atoms." Angew. Chem. Int. Ed. 2017, 56, 9003-9007, DOI: 10.1002/anie.201703754. 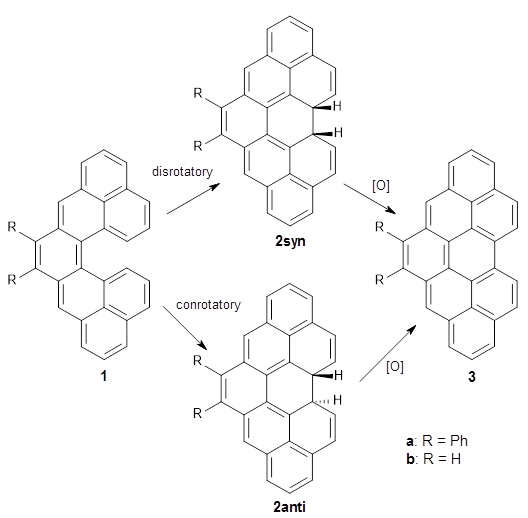 Molecular Shape: A Saddle-Shaped Geodesic Framework of 1,3,5-Trisubstituted Benzene (Phenine)." Angew. Chem. Int. Ed. 2018, 57, 8555-8559, DOI: 10.1002/anie.201803984. 5. 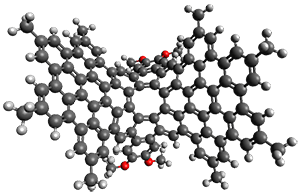 Yuki, T.; Shingo, I.; Kyoko, N., "A Hybrid of Corannulene and Azacorannulene: Synthesis of a Highly Curved Nitrogen-Containing Buckybowl." Angew. Chem. Int. Ed. 2018, 57, 9818-9822, DOI: 10.1002/anie.201805678.